$395. All burials at sea leave the marina at 8am and are typically 2-1/2 to 3-1/2 hours long. We will send you a certificate with the quadrants and sea conditions. The scattering of a loved ones ashes at sea is a honored tradition dating back many years that is becoming increasingly popular. Enchanted Sailing Charters understands that saying goodbye is never an easy thing to do. 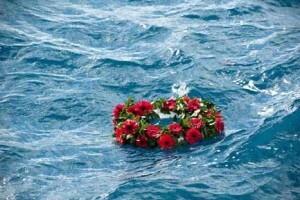 Our crew has overseen burials at sea for over 10 years with courtesy, respect and professionalism. One Certificate of Burial at Sea with the date and GPS coordinates will be mailed to the family, with additional certificates available for purchase.